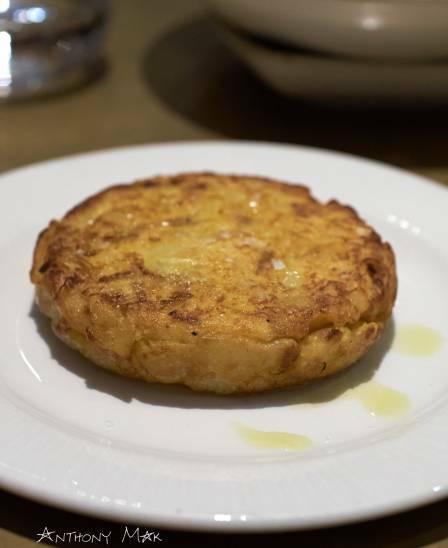 Tortilla de patatas (£5.50), another classic, had all the hallmarks of a traditional Spanish tortilla with its robust eggy and potato-y flavours. But although the flavours were there, the tortilla was slightly overcooked with the potatoes being somewhat mushy. We really enjoyed the king prawns with chilli and garlic (£10) as these were extremely tasty. 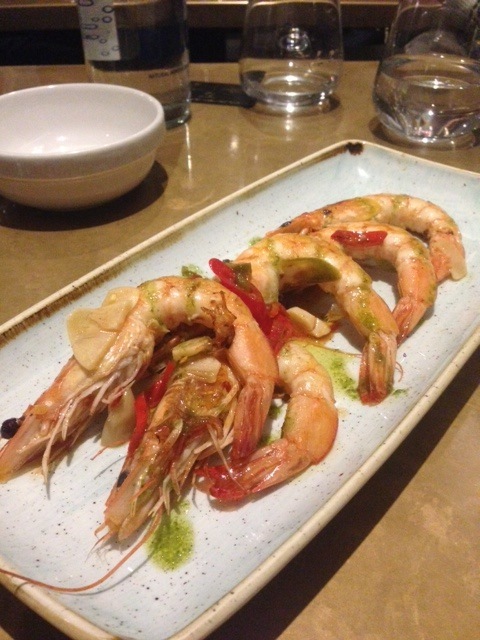 The prawns were fresh with a lovely firm texture with nice touches of of chilli and garlic running through the dish. Another good seafood plate was the boquerones en salsa verde (£6.50). The anchovies were delightfully fresh and perky and the salsa was quite acidic which would suit those who like their anchovies quite tart. 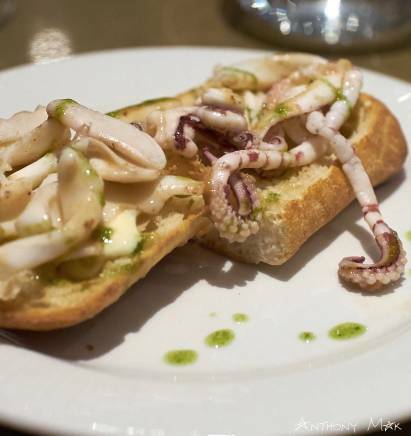 Less successful was the bocata de calamares with alioli (£7) as the calamari were a touch chewy. But otherwise this was a tasty dish, especially with the well-made aioli and the accompanying base of freshly toasted bread. 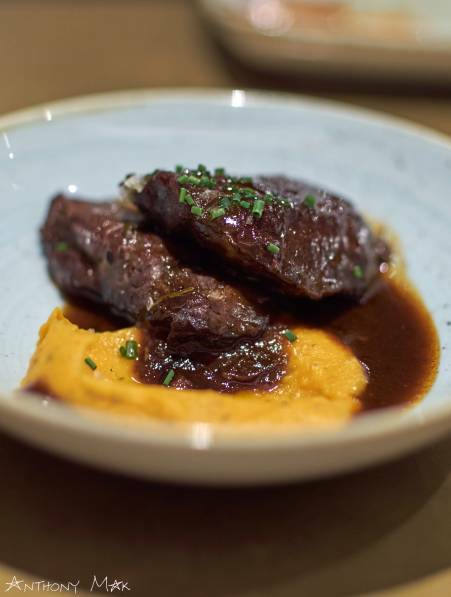 Iberico pork cheeks with a red wine sauce (£8) proved to be a comforting plate of food. The accompanying red wine sauce was delicious, rich and decadent with lots of flavour. The base of sweet potato puree was also very good as it was creamy and light. The pork itself wasn’t bad – it was tender enough, but hadn’t achieved that melt-in-the mouth texture that is to die for. We went for the chocolate pot for dessert, a rich pudding with almost a ganache like texture. Drizzled with a dash of olive oil and a sprinkling of sea salt, I thought this was a nice way to serve the dessert. 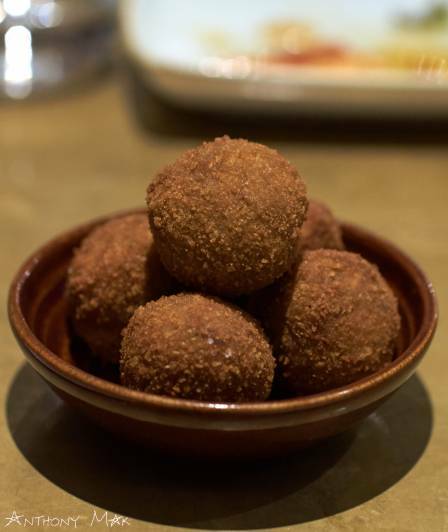 Jose Pizarro Broadgate didn’t quite live up to the standards set by the original Jose Pizarro restaurants, the much-loved Jose and the original Pizarro on Bermondsey Street. The menus might have come from the same man, but the standard of the cooking was less refined and lacked the flair of its siblings. 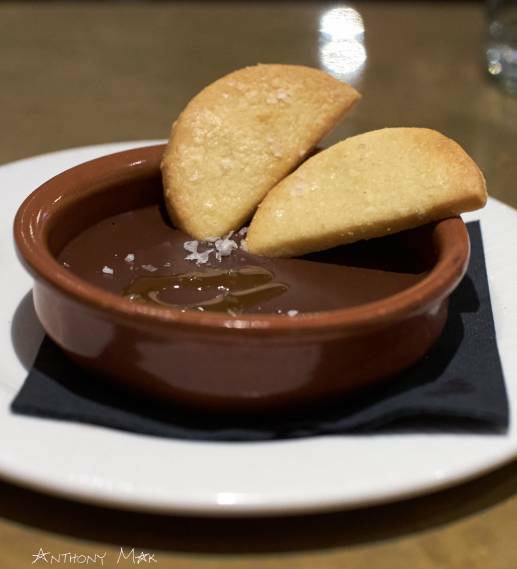 The Pizarro Broadgate experience felt very ‘High Street’, and although there is nothing wrong with ‘High Street’, this wasn’t the sophisticated Pizarro cooking that we’ve come to know and love. A recurring issue with much of the hot dishes that we ate was that they didn’t stay hot. The fact that the restaurant was quite drafty and the plates not being heated didn’t help. But all things considered, and given that we had 50% off, Jose Pizarro Broadgate was pretty good value. One thing I would say was that the service was very good. We had a mishap where we broke a number of glasses. Glass was littered all over the table and the floor. The restaurant cleaned everything up speedily and replaced the food on our table. What great hospitality! 1) The king prawns with chilli and garlic. 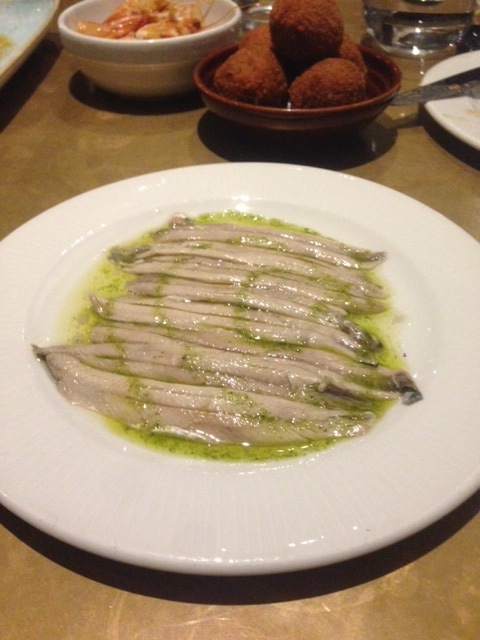 2) The anchovies were very good, especially if you like them very tart. 3) The restaurant was really kind to us, given the big mess we had made. 1) On the whole the food was pretty decent, but it just doesn’t have the flair of Jose or Pizarro’s on Bermondsey Street. 2) The fact that the food turned cold rather quickly. Price: About £30 to £40 a head, excluding drinks and service. Note we dined on the 50% off on a Saturday offer currently available through OpenTable.com.